Mythology about the Niagara area is plentiful. There is something about the Niagara geography, territory, making the region known for larger than life stories. Some stories are true others are not. One such story is that of a Native girl named Lelawala. 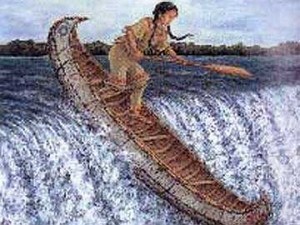 The original Iroquois legend is about a young Seneca girl who while in a canoe was accidentally swept over the falls. She was rescued by Hinum “the Thunder God” who shows how her people can destroy the monster snake residing in the river. The ensuing battle creates the Niagara Falls we see today. “I guess that’s exactly what it is a myth, a legend,” says Niagara Falls official historian Sherman Zavitz. Rick Hill, a Tuscarora native who teaches at Six Nations Polytechnic near Brantford, says there’s some truth to the Lelawala story that of a woman, Thunderbeing spirits and a huge serpent living near the Horseshoe Falls. “Some elements of what is commonly-known today were derived from native stories, but they’re often times greatly exaggerated to sell a certain narrative,” says Hill, who teaches indigenous history and culture to natives and non natives. In Maiden of the Mist: A Legend of Niagara Falls, released in 2001, Charles blended the original Iroquois story with that of its European counterpart. Veronika Martenova Charles, who studied and has a degree in mythology, says extensive research proved aspects of the story were “not all nonsense,” but that the Iroquois indeed did not practice human sacrifice.